Are you looking for a way to add style, beauty, and a little shade to your outdoor space? 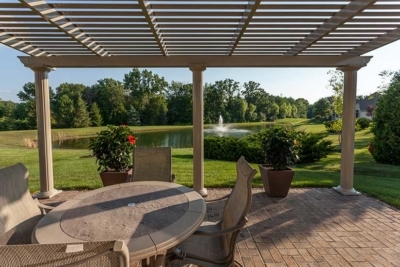 A pergola may be exactly what you’re looking for! W.A. Zimmer installs pergolas by TEMO. With a unique curved lattice roof, gorgeous columns, and a rich architectural style, TEMO pergolas offer better protection from the sun. A pergola is an outdoor structure consisting of columns that support an open roof of beams and rafters. Pergolas have many applications and are very versatile. They can be either free-standing or attached to your house, built over a deck or patio, or placed anywhere around your property where you want to create a one-of-a-kind outdoor living space. 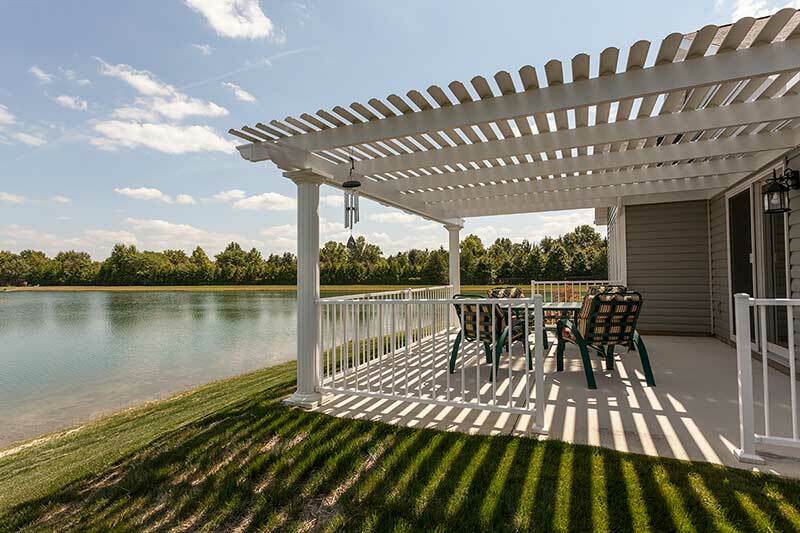 While you may have seen pergolas made from wood or vinyl, an extruded aluminum pergola adds beauty and shade without the maintenance of a wood pergola to make a lasting impression. This structure can be operable to protect and shelter you from the outdoor elements or it can be stationary. At W.A. 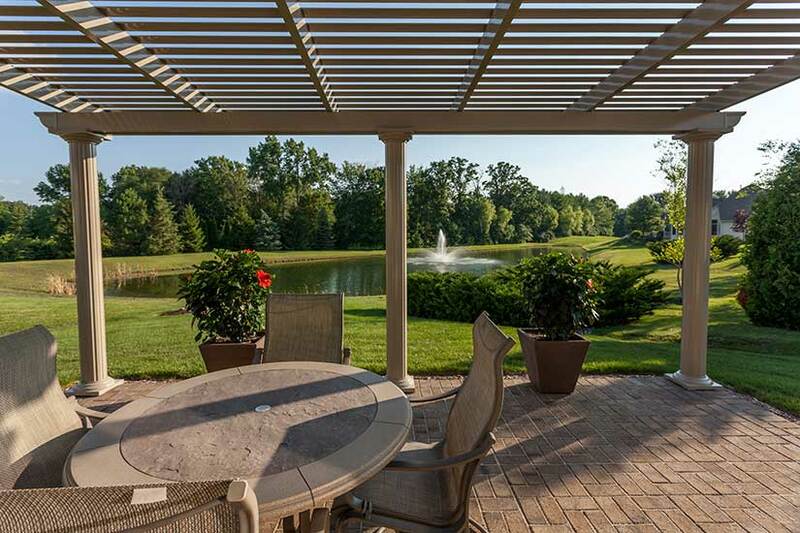 Zimmer, we work with you to determine the best style of pergola for your home or setting. 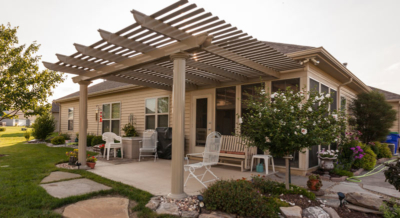 What is a Pergola Used For? 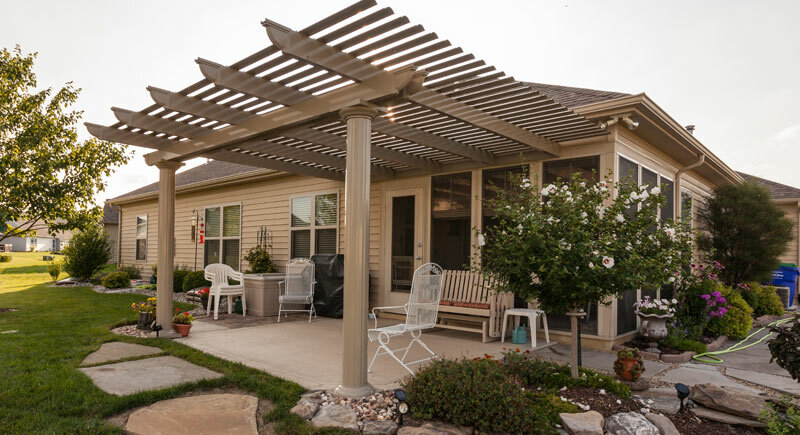 Pergolas define your outdoor space as well as add shade and privacy. They are perfect for entertaining family and friends or making a comfortable area to lounge under at the end of a day. Pergolas provide protection and shade from the elements – Pergolas offer comfortable shade from UV rays, while still giving you that enjoyable outdoor experience. It is the best of both worlds. Pergolas are extremely versatile – Do you want a patio pergola? A pergola on a deck? A pool pergola? We can help you create the outdoor living area that you’ve always dreamed of. Pergolas come in a variety of sizes, styles, and options and will provide long-lasting beauty to your backyard. Pergolas can add significant value to your home – It’s very well-known that well-landscaped homes can be worth up to 20% more in real market home value. Wouldn’t it be nice knowing that you were creating a beautiful space for your family to enjoy the outdoors and adding real value to your home? Free Standing Pergola – this is the most flexible type of pergola. It can be installed anywhere around your property and is the perfect solution for a pool, deck, or patio. Garden Arbor – this is the perfect way to accentuate your garden or beautiful landscaping. Garden Arbor Pergolas feature an open-beam design, which makes it ideal for displaying climbing vines. Attached Pergolas – attached pergolas are fastened directly to the exterior of your home, providing partial shade for patios and decks. 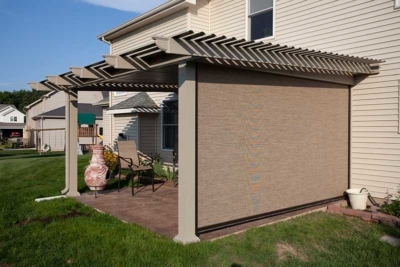 Operable Pergolas – operable pergolas are quickly becoming the most popular way to add the style, shade, and protection from the elements. 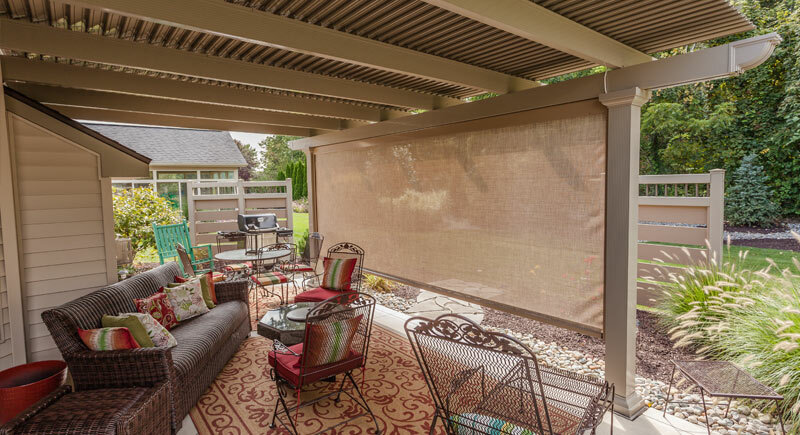 Go from pergola to patio cover for partial sun or complete shade with the push of a button. Visit our showroom in Huntington to view complete pergolas on display. See the material and quality for yourself! We stock pergola material and can usually do the job in a couple weeks. We buy in truckload quantities for the best pricing. All pergolas are custom built from our stock (avoiding problems with kits). 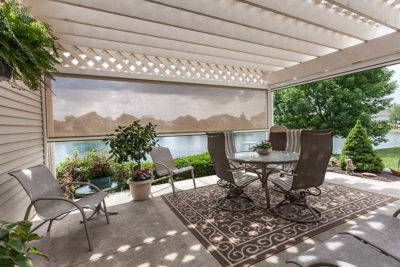 What is an Operable Pergola? An operable pergola (or motorized pergola) is a pergola solution with maximum control — it’s like having a pergola and patio cover in one stylish solution. 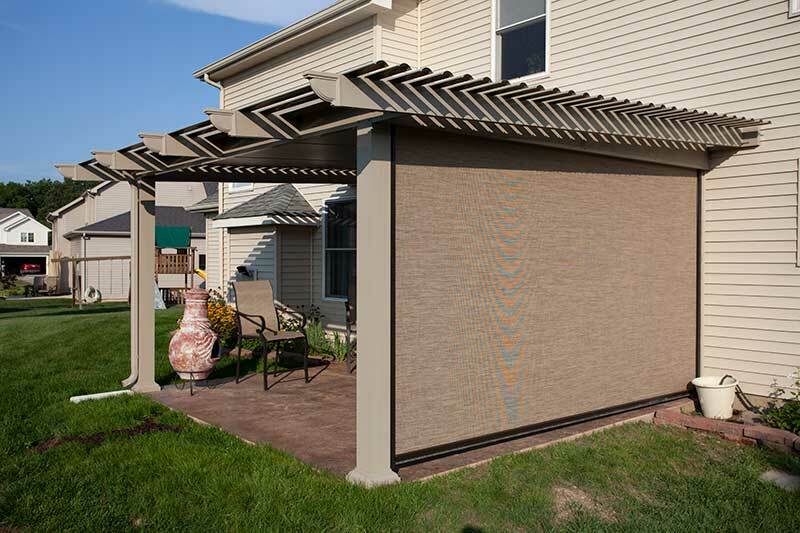 Operable pergolas can transform a slatted, open roof into a fully-enclosed patio cover with the push of a button. A motorized pergola offers total flexibility – whether you are looking to create a fully shaded area or just a little bit of shade, you don’t have to decide. You can have both! Operable pergolas are perfect for sunny days and even rainy days. If that large rain cloud moves in during your outdoor party, there’s no need to rush inside. Simply close the roof and continue the party! Are you ready to add a pergola to your outdoor space? Contact W.A. Zimmer today to schedule your free in-home estimate. Our pergola contractors will come out, talk with you about your needs, show you pergola designs, take a look at your space, take a few measurements, and give you a free, no obligation quote on your next outdoor home improvement project. Contact your local pergola builder today to get started! We install pergolas in Fort Wayne, Huntington, Warsaw, Angola, Kendallville, Marion, Wabash, and surrounding areas including lake homes. Fill out the form to schedule a free in-home estimate. 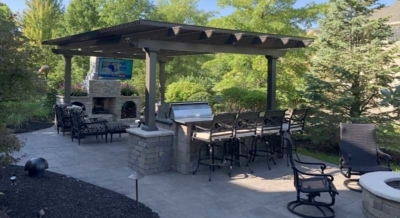 One of our pergola designers will come out, discuss your needs, take a look at your space, measure, and give you a price on a new aluminum pergola.